The Complete ICD-10-PCS Training package by nationally recognized coding expert Lynn Kuehn takes you from beginner to advanced in minimal time. Bonus! 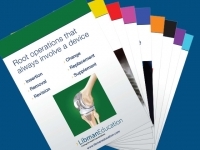 Purchase the Complete ICD-10-PCS Training and receive Libman Education’s ICD-10 Root Operations Flash Cards at no extra charge. Introduction to the structure and design of the ICD-10-PCS system and coding guidelines by nationally-recognized coding expert Lynn Kuehn. Course provides education on assigning codes within the medical and surgical section of ICD-10-PCS, with complete education on the 31 root operations used in the coding process. How to code procedures in the Medical and Surgical-related and Ancillary Sections of ICD-10-PCS, including obstetrics, imaging, mental health, and more: definitions of root operations, index and table concepts, and selecting the correct characters based on the documentation. Also master new root operations, root procedures, and root types within the last 15 sections of PCS. Provides a ‘deep dive’ into the specifics of ICD-10-PCS organized by body system. Building on the foundational basics of the ICD-10-PCS system (definitions of root operations, index and table concepts, and selecting the correct characters based on the documentation), ICD-10-PCS, Part 3 Advanced Coding by Body System will teach you how to code the top 500 procedures performed in U.S. hospitals. Learn to code vascular procedures with the unique perspective and expertise offered by nationally recognized ICD-10-PCS coding expert Lynn Kuehn! ICD-10-PCS: Vascular Procedures enables coders to apply the definitions of the approaches to the tools and techniques used in vascular coding, analyze operative report documentation to correctly assign all ICD-10-PCS characters, and more. Includes Lynn’s ICD-10-PCS Vascular Roadmap Flash Cards! Learn to code cardiac procedures with the unique perspective and expertise offered by nationally recognized ICD-10-PCS coding expert Lynn Kuehn! ICD-10-PCS: Cardiac Procedure Coding enables coders to visualize and understand complicated 3-D cardiac structures and then accurately and completely code the intricate surgical procedures performed. Learn to code orthopedic procedures with the unique perspective and expertise offered by nationally recognized ICD-10-PCS coding expert Lynn Kuehn! ICD-10-PCS: Orthopedic Procedure Coding enables coders to visualize and understand complicated 3-D skeletal structures and then accurately and completely code the intricate surgical procedures performed. The course includes a special focus on difficult-to-code spinal procedures.